Do Greenhouse Gases Actually Warm Earth? Prove it! 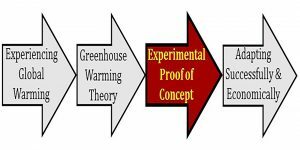 Greenhouse-warming theory has never been proven experimentally. No one has ever demonstrated in an experiment that increasing concentrations of carbon dioxide actually cause air to get significantly warmer. How could all the nations of the world be preparing to spend trillions of dollars per year to reduce greenhouse gas emissions when there has never been proof of concept? What has happened to the scientific method? In 1859, 157 years ago, John Tyndall demonstrated in his laboratory in Britain that carbon dioxide gas absorbs infrared radiation from Earth. Most people assume, therefore, that air containing increasing amounts of carbon dioxide must be getting warmer. Yet we now know for sure that infrared energy is absorbed into the bonds that hold the CO2 molecule together. These bonds are oscillating over a broad range of frequencies, and when these bonds absorb infrared radiation, the amplitude of oscillation is increased at each frequency of oscillation. Temperature of a gas, however, is well known to be proportional to the average velocity squared of all the molecules and atoms that make up air. Conversion of bond energy to kinetic energy of gas molecules moving at some high velocity is not very efficient. Furthermore, there is only one molecule of CO2 for every 2500 molecules of gas making up air, so the energy absorbed by one molecule of CO2 must be shared over 2500 other gas molecules. Spectral physicists have now documented in precise detail that a molecule of CO2 only absorbs infrared energy at discrete frequencies that are the resonant frequencies of oscillations of these bonds. What we sense as heat and as temperature, however, is based on a very broad continuum of frequencies described by Planck’s law. CO2 molecules, therefore, absorb only a very small fraction of the heat radiated by Earth. Climate models calculate warming caused by greenhouse gases absorbing infrared radiation from Earth, but climate models have not predicted global temperatures correctly since 1998. Something is wrong with the mathematics that these models use. The models were designed and tuned based on warming observed prior to 1998. From 1998 through 2013, however, there was no significant increase in global warming while concentrations of CO2 increased at the highest rates observed since measurements began. These models are based on key assumptions in physics that have never been proven experimentally. A fundamental concept in the scientific method is that new ideas need to be tested before they can be considered to be valid theories. In 1900, Knut Ångström, a famous spectral physicist, demonstrated in the laboratory and in the field that the warming of air caused by increasing amounts of CO2 does not appear to be significant. This classic work, which convinced physicists 116 years ago that greenhouse-warming theory is not physically correct, is today being ignored by most climate scientists and even laughed at by a few as we race to reduce greenhouse-gas emissions before Earth’s climate degrades beyond some imagined tipping point. Don’t you think it would be wise to carry out such simple and inexpensive experiments to prove the models are correct before raising the cost of energy, something we all depend on critically? Such experiments could be done quickly.